The baritone ukulele is a bit of a strange beast. Ukulele folks want it in order to lower their available range and depth and guitar folks are puzzled why they only have four strings. Most baritone ukuleles loose the sparkle and clarity of a uke tuned gcea and you end up with a dark, quiet, muddy sound. 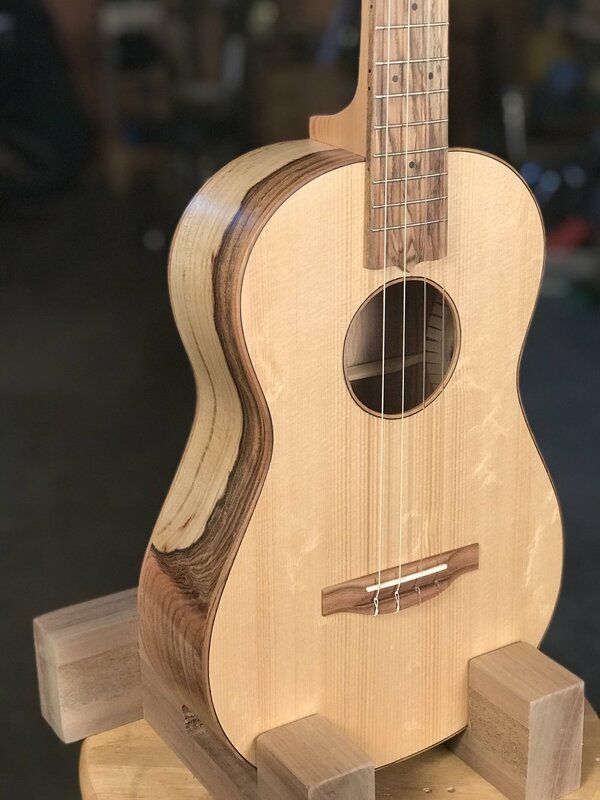 The goal then, should be to create an instrument that gives the uke player more range, keeps the crisp tone that an ukulele needs and makes the guitar players jealous. Deep and rich but bright and punchy. This combo of spruce and pistachio nails it, in my opinion. The spruce is salvaged old growth from Alaska Specialty Woods and the pistachio is grafted orchard wood from woodfromthewest.com.